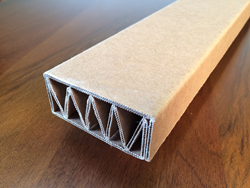 In a very important breakthrough that touches a number of different parts of the building and DIY world Cardboard Lumber™ is now available through Alta™ Board. This new product is an alternative to wood, which is stronger, weighs less and is competitively priced. Customers have responded with enthusiasm. There's many good reasons for builders and DIY enthusiasts to look for alternatives for wood to use in their work, ranging from environmental concerns, to budgeting or aesthetics. The quality of these products, until now, has varied greatly in the eyes of most experts. Stepping up to offer a very impressive resource in this area is Cardboard Lumber™ brand Alta™ Board. The brand's Cardboard Lumber® is a true alternative to wood, where one piece of recycled cardboard is folded and laminated in the shape of a 2"x4", providing an incredible amount of strength and performance at a 1/3 of the weight of wood and at a very attractive price point. According to Alta Board, some of the more common uses of their Cardboard Lumber have included: building cardboard tables; cardboard crates; cardboard pet houses; chairs; displays; and much more. Feedback from customers has been very positive.